Use A Beach Theme Baby Shower And Have A Ball! A beach theme baby shower is great to use in the summertime. Create a beach atmosphere in which your guests can "hang loose" and enjoy themselves. Cut card stock or foam sheets into the shape of a flip flop sandal. Use cute ribbon, sequins or feathers to create the front strap. Put the recipient's name on the front of the flip flop. Write the invitation on the back of the flip flop. Swim over to (hostess's house) to celebrate the new fishy in coming to (parent's names) It will be held on (date) at (time). It will be lots of fun, if you catch our "drifts". Hope to "sea" ya there! Decorate it with fun stickers of sunglasses and flip flops. Beach ball toss- This activity can be used to break the ice in the beginning of the baby shower. Hand a beach ball to one person in the circle and have them state their name and something about them. They can name a hobby or anything interesting. They then will toss it to another person in the circle to do the same. You can also have them state how they know the mommy to be. After everyone has had a turn, pass the ball around for everyone to sign and give a baby wish. Decorating baby items- Get the little one ready for some fun in the sun by decorating some baby items for the baby to use at the beach. Lay out some baby items such as onesies, sun visors or hats, swimming robes, sun glasses and a swimsuit for guests to decorate. Place out paints, markers, ribbons, embellishments and other decorative items for them to use. Beach dress up relay- Split up the guests into teams. Set out 2 piles of beach items including clothing and swim items. Each person must put all of the swim items on and pose for a picture before they can tag the next person in their line to do the same. The first group to get done wins. Add some fun to this game by using an ironing board or surfing board for the guests to pose on for their picture. Musical Beach Towels-Lay out beach towels on the floor in a circle, making sure there is one less towel than there are players. Put on some beach music and have everyone walk to the music like musical chairs. Limbo- Well, this is a classic game I could not pass up. Play limbo. (pregnant people can sit this one out). Fill the room full of beach items. You can include sea shells, starfish, beach balls, flip flops, flippers, lounge chairs, snorkels, beach towels, rafts, suntan lotion, sunglasses, and edible sand in jars. Display food treats around the room in sand buckets. Drape light or dark blue plastic table cloths on the walls to resemble water. Have a bubble machine going to create a fun water feel. Decorate the food table by sprinkling sand down the middle of the table. Place shovels, buckets, sea shells and tea lights on the table. When choosing your food, think summertime. Grill up an All-American beach party with hamburgers and hot dogs for everyone. You can also do submarine sandwiches. Potato salad and fresh fruit help to round out the meal. Fill a glass bowl with blue Jello with gummy fish. Make octopus hot dogs by cutting the hot dogs halfway up each side into four strips. Boil it in water. When you do, it will cause the hot dog strips to curl and look like octopus legs! 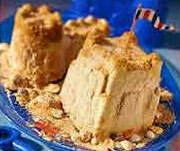 This is a really cool beach castle ice cream cake that is fairly easy to make. For directions click here. Pour sand into mini bottles for guests to take home with a cute note on it. Instant beach in a bottle; for when you can't make it to your favorite beach. Just sprinkle the sand in-between your toes and relax. Compliments of (hostess, parents names) and the new baby on its way!